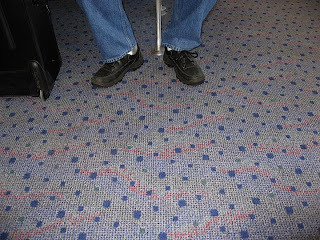 Airport carpet is among the ugliest carpet every designed, it is particularly ugly in Logan Airport’s C terminal in gate 25. The Carpet is faded navy with forest green, red, and faded navy polka-dots. The over all effect –when seen from a distance– is sort of a grey blue, up close, with in about 5 yards of you, it looks awful. I guess it hides the dirt well. I wonder who designs Airport Carpets. Did someone sit down and specifically design a carpet that would hide dirt, be incredibly ugly, and laid down in carpet squares? Who picks the carpet for airports? Is there a Designer who specializes in Airport Terminal Tedium? Do they go out and pick the least attractive carpets to fulfill their secret sadistic tendencies? To their credit, the seats aren’t all bad, they’re more comfortable than airplane seats, but that hardly makes up for the eye-sore carpets. In a way, ugly, inexpensive carpet in an airport makes sense. As long as the carpet is durable, or mostly durable. After all, hundreds of people a day walk over it, ignore it, and spill drinks on it. Children also play on it, grind crayons and goldfish into it, and crawl upon it. I wonder what sort of microorganisms live in the carpet. No one really sits in a gate all that long, just a few hours before they board an airplane, or walking though it on their way to claim their baggage and wreak havoc on their loved ones (or greater humanity). In the long run, I don’t think the carpet in the airport terminal effects the over all flight experience, however, they should make an effort to make terminal carpeting slightly more attractive. Then again, airlines (and airports) really don’t seem to care about being ascetically pleasing, comfortable, or in any way convenient. Why should the carpeting be any different?